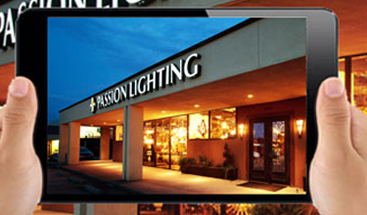 Images for Passion Lighting. Images ©2011 Jason Kindig, www.JasonKindig.com. 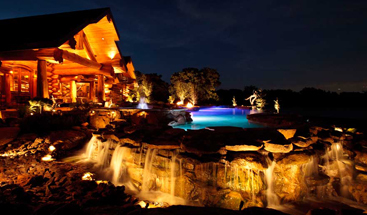 Landscape lighting can be broken into two major categories including line voltage (120V) lighting and low voltage lighting. The bulk of this summary will focus on low voltage lighting, a far superior lighting option over line voltage. Line voltage lighting is typically described as 120V power type fixtures. The nature of this product group is that the fixtures are much larger than low voltage lighting fixtures. Sometimes 3 to 5 times larger. Also, because the power feed is 120V, conduit, electrical boxes and other requirements exist for local electrical code requirements as well as for safety reasons. This causes more impact to the site as well as increases costs and reduces finished visual appeal. In addition, because this is an outdoor application type product group, water is an additional issue that makes 120V more difficult and can be much more dangerous when used incorrectly. 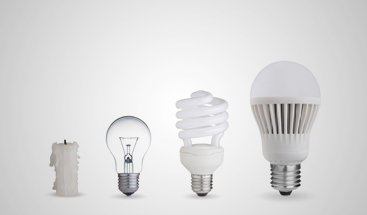 Lighting Gourmet strongly believes that low voltage lighting is much better solution in almost every case and with the growth of LED, has improved the solution even further over the traditional 120V solutions. 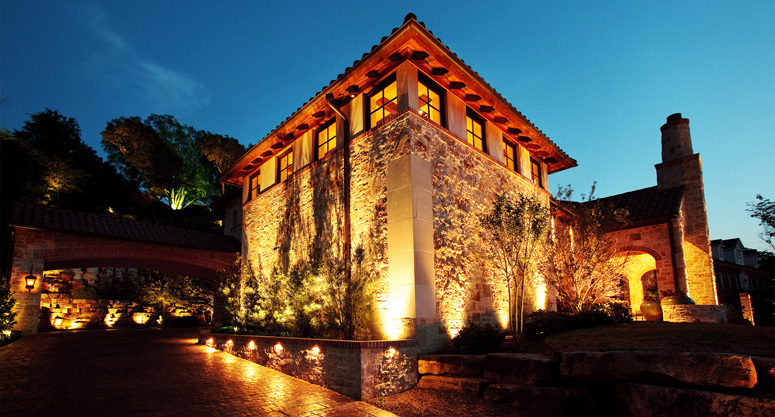 A low voltage landscape lighting system includes a number of fixtures, 1 or more wire runs from the transformer to a group of fixtures, a high quality transformer with a plug in timer and plug in photo cell. All transformers must be protected by GFCI plug or circuit. 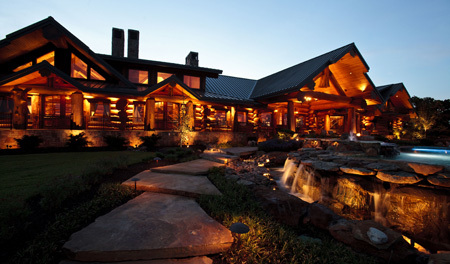 In additional, high quality landscape lighting transformers have built in circuit breakers as well for additional safety. Below is an expanded explanation of the above aspects of a system. Transformer – high quality brands include Hinkley, Kichler, Focus, and Hadco. Characteristics of a very transformer include a lifetime product warranty, stainless steel or other high quality shell, built in 120V grounded plug, a plug and remove timer option, plug and remove phot cell option, and built in circuit breakers. Transformers sizes will vary from 75 watts up to 1200 watts. With the high growth of LED. Transformers are shrinking in general with 1200 wt transformer leaving the market relatively soon. While 1500 wt transformers previously were commonly used in large installations, that group has been greatly reduced and many sources have discontinued that product, with Lighting Gourmet believing 1200 wts headed in the same direction. High quality transformers are multi tap which means there are multiple wire ports from either 11V or 12V up to typically 15V or 17V. These taps allow each wire run to be feed by a level of voltage that will reduce down to 12V by the time the first lighting fixture on the wire run is placed. This has been and continues to be critical for low voltage lighting to work properly. This is also the most common mistake and the most likely error in low voltage lighting installation when completed by anyone less than the most qualified installers. Even if the wires are tapped wrong, the fixtures will light up, an in many cases will appear normal. Signs that the taps are incorrect include a shorter to much shorter lamp life, overly bright lights, or much less bright than what should be. Be aware, inexpensive transformers that do not have multi tap, do not have a plug and remove timer option, a plug and remove photo cell option should be avoided. They offer a lower cost. Other than that, they will create problems and create limitations forever. Never use this type of transformer unless absolutely required for budget purposes. Low Voltage Wire & Connectors – while wire gauges will vary including the most common of 12/2 low voltage cable. Less common is 10/2 low voltage cable, used for high loads and longer wire runs. A less used and generally not recommended wire is 14/2. With the advent of LED lighting, 14/2 is an option, though the Lighting Gourmet still believes 12/2 low voltage wire allows the greatest flexibility and the additional cost is not significant in most 10 to 30 light fixture installations. It is important to understand wire load, fixture placement, and voltage drop which varies based on each aspect of the wire run. Low voltage wire can be purchased by the foot or by the roll, with 500 ft rolls being one of the more commonly available lengths. Cost per foot is typically 25 to 50% higher when purchased by the foot. Splicing wires should be avoided in all cases, unless circumstances do not allow. Wire splices create another failure point possibility, and in many poorly designed/poorly installed systems have wire connections for every fixture. This poor design technique creates a future failure point at EVERY fixture, thus increasing he maintenance issues over the year that will only grow over time. Non cutting wire connection techniques should ALWAYS be sued for a properly installed low voltage system. Connectors vary a lot, and can cost from $2 to several dollars each. Many of the better brands come with a high quality connector, though this varies widely in the industry. Low Voltage Fixtures – include hundreds of fixture options and vary in application, lamping, size, finish and other key characteristics. Fixture types include bullets, wall washes, wall lights, niche lights, down lights, path lights, moon lights, in-ground fixtures and so many other. The MR16 bullet is the number one low voltage fixture and is used for a wide variety of light applications. VERY small, made of many materials and many finish options, the bullet can be sued to light many landscape aspects from a small 2 to 3 ft Japanese Maple tree to a 50 ft tall top growth pine tree. The actually lamping of the bullet will dictate the final results and can vary widely with many lamp options. Lamp options for MR16 vary from non-LED to LED. Non LED MR16 have about 10 core options from 20wt to 50 wt, from narrow beam spreads to wide flood. A shift in the low voltage lighting world over the last frw years has increased significantly the use of LED MR16s. Using up to 80% less energy, with the same lumen results, this lamp option is often the best choice. Cost has fallen significantly and is not much higher. The lower wattage allows smaller transformers and more fixture per wire run. The only major limitation is the very limited number of beam spread, typically only two. There are special techniques to override this including the use of specialty lenses. Controls – controls can be of many types including the most common of timers and photo cells. Other options including remote switch controls or home system controls and similar. Timers are typically in one of two categories including mechanical timers and digital timers. Mechanical timers are inexpensive, simple to set and easily replaced. Mechanical timer drawbacks include losing the timer setting when any power loss occurs. Also, digital timers do not allow flexibility for days, all days being set the same vs many who live a lifestyle where weekends are lived differently than weekdays. Digital timers are more expensive and harder to set-up initially but allow much greater flexibility and can be set differently for every day of the week, can be turned on and off multiple times in a day, and high quality timers have battery back-up that maintain the correct time even when power is temporarily lost. Photo cells should be plug in type to allow easy replacement. They can and do go bad. The best transformer control that does not include a home system will be a combination of a photo cell AND a digital timer. This allows the least amount of maintenance by the homeowner along with the greatest flexibility. The photo cell keeps the transformer from turning on during daylight hours, regardless of what the timer tells it to do. In combination, a timer limits the transformer on hours even when the photo cell tells the transformer it is dark. So in combination, when properly set, the combination allows the transformer to automatically adjust to different sun sets throughout the year without constant changes of the timer by the homeowner or installer. Digital timers allow the setting to vary by day or even be set-up to turn on in the evening and back on in the early morning hours, a much more common application than many novice installers think. Enjoying early morning coffee in the back patio before dawn with the low voltage lights on is a magical time. Advanced controls include wall timers. This is a niche category. Using a wall switch to turn on a system should be limited to only situations that require this. Manually turning on a system is typically not a practical or logical solution, with some exceptions. Other more advanced controls including installing transformers on a home system such as Lutron RadioRa or Homeworks. Both of these systems call allow your landscape lighting system to be multi layered, to be controlled based on exact time of sunset and sunrise throughout the year, adjust automatically for daylight savings times and can vary by day. In addition, this type of system control allows override that allows the end user to turn the system on when not normally set to turn on as well as offer early turnoff capability. If budget allows this is by the far, the most advanced and most flexible method to control. 120V Power Source – the transformer will require 120V power feed. This should be installed to all local and national code requirements. The plug must be GFCI protected. It should also be wet/damp protected with the correct cover. It also must be placed near the transformer and not require any type of added electrical feeds or temporary power cords. Always safety first. 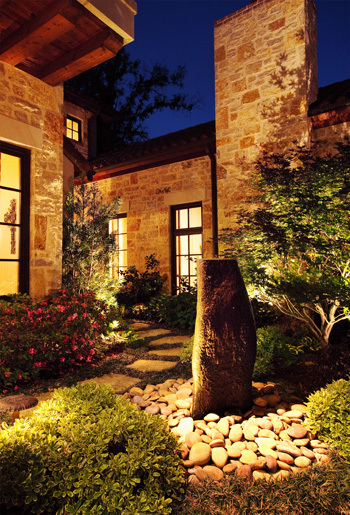 Understanding the components of a low voltage landscape lighting system is the first step to making the decision of what and how to light your project correctly. 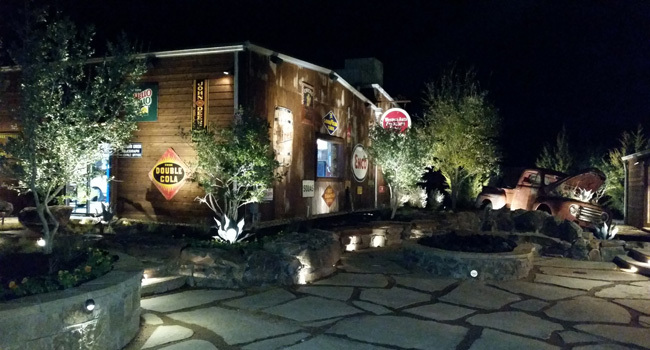 Low voltage lighting can be designed and installed by an installer or installed by a homeowner when done with the correct amount of research and product knowledge. Contact bruce@passionlighting.com if would like to discuss landscape lighting design and installation lighting options for your project. See passionlighting.com for more information.